Based in Tirupur, Tamil Nadu, India, we, Geo International, came into existence in the year 2014. 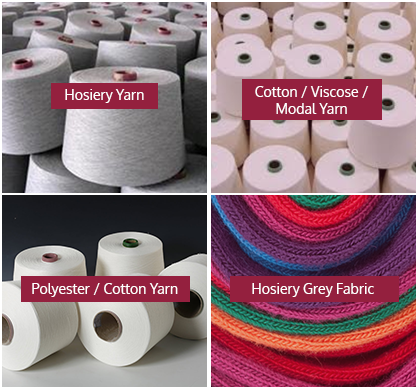 We are reckoned in the market domain as an illustrious trader and exporter of various kinds of Yarn likes Hosiery Yarn, Weaving Yarn, Cotton / Viscose Yarn , Cotton / Modal Yarn, Polyester / Cotton Yarn, Melange yarn, OE Yarn, Hosiery Grey Fabric and the many. Count Range : 10`s to 40`s, We source these products directly from authentic vendors of the market. The quality of these products is tested stringently before their dispatch. We sell our quality approved range at affordable prices. Customer satisfaction is our foremost concern, thus we are ready to put all our efforts to achieve the same. We have been able to mark a respectable position for ourselves in the industry. Avail a wide range of Yarns and Fabrics at Economical prices from us. Catering to the high and ever-rising needs of the Garments Industry we have founded the organization Geo International.in2014. We are Young and Dynamic Company with 21 Years of Experience in Yarn and Fabric Field. In the short span of time, we have quickly emerged our self as one of the fastest growing player in the market. Our collections include Hosiery Yarn, Weaving Yarn, Cotton / Viscose Yarn , Cotton / Modal Yarn, Polyester / Cotton Yarn, Melange yarn, OE Yarn, Hosiery Grey Fabric and the many. Count Range : 10`s to 40`s, We acquire these products from few of our selected vendors, who are committed to offer only the high quality. The Good Manufacturing Practices that are incorporated by them during the product development phase nullifies the chances of any defects in the items.These Yarn and Fabrics are used in the Textile Industry to make huge variety of Garments Products, The rich quality of our products is appreciated all over the world.We hold almost 75% of Export and 25% of Domestic.